Info "Here at Wario's School of Culinary Arts, we don't believe in spoons. So what you gotta do is mix the ingredients by tossing them up in the air." Wokka Wokka! is a microgame in WarioWare: Smooth Moves. It appears in the Wario stage and the Tiny Wario stage. 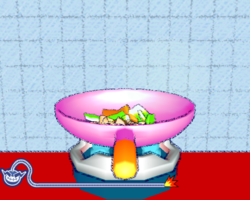 The player is cooking some food and needs to shake the Wii Remote up and down to fry the food and cool it down. 1st level difficulty: The player needs to fry only a small amount of food. A little boy in a blue shirt gets this meal. 2nd level difficulty: The player needs to fry a decent amount of food. A rather plump woman with cleavage gets this meal. 3rd level difficulty: The player needs to fry a lot of food. A fat man gets this meal. This page was last edited on February 18, 2018, at 23:37.